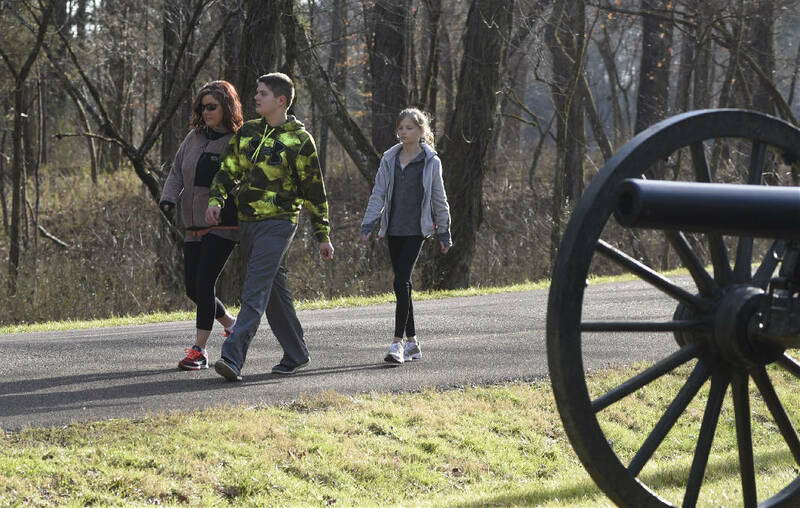 Miranda, Dawson and Katieann (CQ) Thompson, from left, walk in the sunshine at the Chickamauga Battlefield on Wednesday, Jan. 28, 2016, near Chickamauga, Ga. The staff of Chickamauga and Chattanooga National Military Park invites the public to join in commemorating the 155th anniversary of the Battle of Chickamauga. A series of ranger-guided tours, hikes with park historian Jim Ogden, lectures and living history demonstrations are scheduled from Friday, Sept. 14, to Sunday, Sept. 23. Beginning Sept. 18, 1863, Union and Confederate forces clashed along the banks of West Chickamauga Creek. At stake was the transportation hub of Chattanooga. For three days, the armies struggled through woods and fields, leaving behind thousands of young men cut down in the prime of their lives. Despite the Confederate victory at Chickamauga, the Union Army regrouped in Chattanooga, where a Union victory marked the "Death Knell of the Confederacy." Following is a list of events happening this weekend. A complete program schedule is available at: www.nps.gov/chch/chickamauga155.htm. Throughout the weekend, living historians with the Western Federal Infantry will be encamped at the Visitor Center. Young people will have the opportunity to "enlist" and interact at stations on both infantry and artillery drill, as well as daily life for soldiers. After completing all the stations and participating in a program out on the battlefield, young people will earn their Junior Ranger Badge. Company drill and firing demonstrations will take place each day at 11:30 a.m. and 3:30 p.m. Throughout the weekend, living historians will portray the men of A.P. Stewart's Division. Meet at Poe Field to hear first-hand accounts from the re-enactors and to view firing demonstrations. Follow the special program signs to the parking area. Meet at the Visitor Center, bring your own bike and helmet. Meet at Visitor Center for two-hour car caravan tour of battlefield. Meet at the Visitor Center for 45-minute program on Battle of Chickamauga from the perspective of John Vaughan, a lieutenant in the 8th CS Cavalry, who documented his involvement in his diary. Meet at the Visitor Center for a 45-minute program to drive out to Winfrey Field where George Van Pelt and his men fought on Sept. 19, as depicted in the park's orientation film. Meet at Visitor Center for this 45-minute program on the experiences of John McCline, a 10-year-old boy from Middle Tennessee who found himself as a teamster with the 13th Michigan Infantry during the Battle of Chickamauga. Meet at the Visitor Center for this 45-minute program and learn about the battle's effect on Lt. Col. Carter Van Vleck of the 78th Illinois, who was forced to leave his best friend behind in Confederate hands. Meet at Visitor Center for a two-hour car caravan tour of the battlefield with a park ranger. Meet at the Visitor Center for a 45-minute program experiencing the Battle of Chickamauga from the perspective of Julia Snodgrass, a 6-year-old girl whose home became the scene of the horrific climax of the battle. On the morning of Sept. 20, Confederate Gen. John C. Breckinridge ordered Confederates to attack the Union line along present-day Battleline Road. In doing so, did Breckinridge break an oath to support the Constitution of the United States? Learn about the action on this end of the Union line during the battle and discuss the ramifications of his actions. Meet at the Visitor Center for this 45-minute program. Meet at the Visitor Center for a two-hour car caravan tour of the battlefield. Meet at the Visitor Center for this 90-minute walking tour through Winfrey Field discussing battle action there on Sept. 19. Meet at Visitor Center for this two-hour walking tour covering Stewart's breakthrough from Brock Field to the Brotherton and Poe farm sites.